Recently Henry, Bandit and Skipper enjoyed reviewing Wagg Tasty Bone treats here which they absolutely loved. 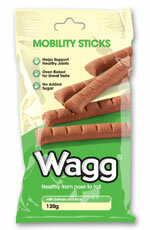 Now, thanks to the lovely people at Wagg, they have been tasting Wagg Mobility Sticks - aren't they lucky boys?! At 7 years old, Henry is now classed as a 'veteran' in the dog world, and his joints occasionally click and has sprouted a few grey hairs (we've told him that they look very distinguished!). So we were very keen for him to try these treats as they contain glucosamine and chondroitin to help support joint health and mobility, they also contain his favourite ingredient - Salmon! Anything that will help prevent his joints deteriorating further and causing him pain has surely got to be a good thing, so the fact that they also proved to be really tasty is an added bonus. The sticks can be fed whole or broken up into smaller bites that are ideal for training treats - here's Henry demonstrating the 'sit' and 'leave' commands! I'm a cruel mummy making him wait for these! Even though Skipper and Bandit are still young, these treats will still benefit them and their future health so Henry was kind enough to let them try them too. As with the other Wagg treats, they absolutely loved them, and their tails never stopped wagging. The sticks are oven baked to make them extra tasty, and judging by the keen expressions on the dogs' faces this has definitely worked! As well as glucosamine and chondroitin these treats are also enriched with vitamins and minerals. They contain no artificial colourings or flavours, and no added sugar. So these are a healthy, tasty treat for dogs of all ages. We are about to get a dog, so these have been duly noted!